In 2016 I graduated with a BSc (Hons) in Zoology from the University of Reading. I picked the degree because I always loved animals and really enjoyed science at school. But studying zoology has given me a whole new appreciation for the natural world and a new interest in palaeontology and natural history collections. During my degree, I had access to the university’s lovely little museum, called the Cole Museum of Zoology. I had many practical lessons based on the Cole’s collections, and even did my final year dissertation on studying their ichthyosaur fossils. In addition to this, I was lucky enough to gain a lot of work experience there through volunteering and doing summer placements. Initially, I helped with cataloguing the Cole’s seashell collection into a little notebook. But eventually I was assisting with rehousing a huge fossil collection, which involved re-boxing specimens, identifying the material, generating unique accession numbers for them and creating new records for a database. I enjoyed my time at the Cole very much and was sad to say goodbye after graduating and moving back to London. 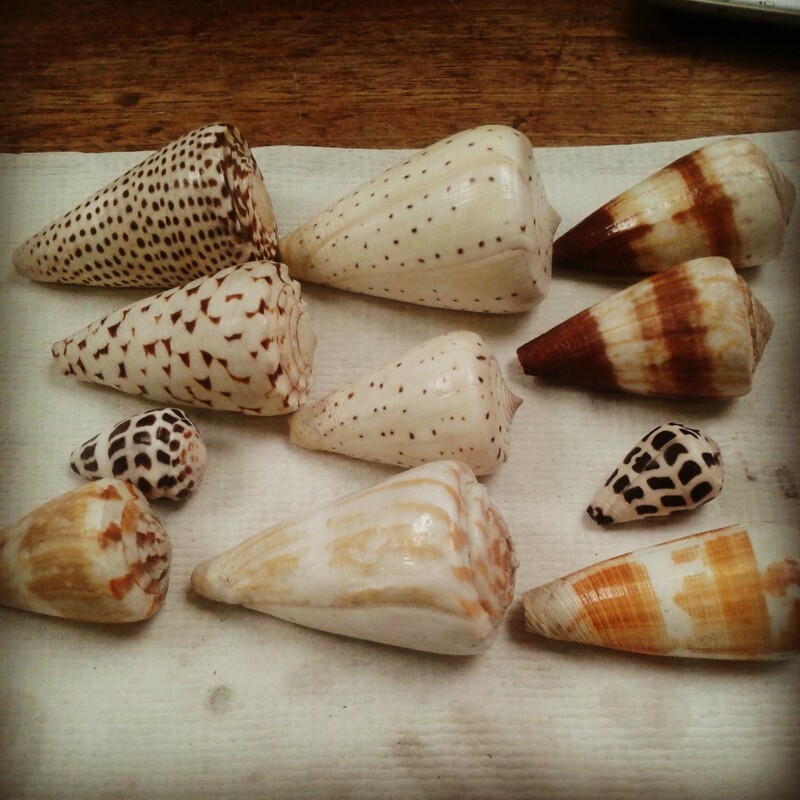 Some beautiful cone shells, belonging to the Cole Museum of Zoology’s shell collection. Life after graduation was fairly chilled at first, free from university deadlines and the horrors of exam stress! Eventually I began working in retail while I continued to look for a career in science research or more interestingly… natural history museums. But I was beginning to lose hope as these kinds of opportunities were very competitive and felt very rare. I really started to miss being in the museum environment (and dislike being in retail… sales assistants have feelings too!). However, I started to feel hope again when last year I met with Dean Lomax, ichthyosaur expert and palaeontological whizz, who was very interested in my own ichthyosaur research. After I told him I wanted to get back into palaeontology, he recommended I contact Dr Emma-Louise Nicholls, the Deputy Keeper of Natural History at the Horniman Museum and Gardens, to see if there were any volunteering opportunities. Fortunately, they had a position available in the volunteering department and before I knew it, I was volunteering for a natural history collection again and surrounded by beautiful belemnites, brachiopods, graptolites, trilobites etc… my inner nerd was free again! It was wonderful to be back in a museum environment, sorting through these ancient fossils that I had missed being around. It has also been a great experience learning how to use museum software. Previously at the Cole, I had been using simple Excel spreadsheets to catalogue and update records for specimens. But at the Horniman, I have learnt how to use the collections management system, Mimsy XG, and I feel a little bit more like a museum professional! I definitely have a soft spot for palaeontology, and volunteering for the Bennett Collection of fossils at the Horniman has reminded me of my appreciation and fascination of these extinct creatures, and how I (somewhat weirdly) find enjoyment in the systematic organisation of natural science collections through areas such as taxonomy and locality (I didn’t think I could sound any nerdier!). I have been volunteering here for a while now and if there is one thing I love about volunteering at the Horniman, it’s that everybody working there always seems so calm and friendly! Much unlike the horror stories I’ve heard from my sisters about working in finance or for the government… it is definitely the type of work environment I’d like to be in. Alongside getting my paleontological fix every week at the Horniman, I continue another passion of mine that is inspired by the natural world – my animal illustrations. I have always enjoyed art and drawing animals. More recently, I have become quite the fan of painting detailed illustrations of animals in watercolour. Artwork which I can only hope one day will end up as prints for people to bring a touch of nature into their homes (or maybe even to add a splash of colour to a natural history book?). I can only dream! I regularly post new artwork on my Instagram account, @rmistryyy, so please do follow! My experience at the Horniman Museum has reminded me of the importance of preserving these incredible historic collections. They’re significant for their contribution to geological and fossils records, studying the evolutionary relationships of past and living organisms and even to predict the ecological effects of future events that may have also occurred in the past. Plus, although I may play a very small role in the process, it feels great to be a part of it.